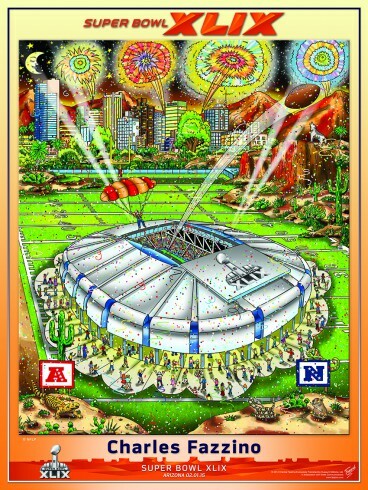 The big question on everyone’s mind is “WHERE CAN I SEE THE SUPER BOWL COLLECTION AND MEET CHARLES FAZZINO DURING SUPER BOWL WEEK.” The NFL Shop at the NFL Experience will feature the entire Fazzino art collection. The Shop opens on Saturday, January 24th and is open through Super Bowl Sunday. It is located in the Phoenix Convention Center at the end of the Verizon Super Bowl Central football fan park. Charles Fazzino will be on hand for several hours each day beginning on Wednesday, January 28th through Saturday, January 31st. In addition, a few NFL superstars will be stopping by to sign autographs with Fazzino including Jay Feely (Thursday, January 29th 5pm), Steve Weatherford (Friday, January 30th at 1pm), and Quinton Coples (Saturday, January 31 at 1pm). The Store, although part of the NFL Experience, is open to the public and you DO NOT NEED an NFL Experience Ticket to Enter! You can also visit your favorite authorized Fazzino Gallery or email us at info@fazzinocollectors.com about purchasing information for the Charles Fazzino Super Bowl XLIX Art Collection. In the meantime, stay tuned on our Facebook page for our football trivia challenge! We’re giving away a few Super Bowl XLIX posters! Time: Check Website for Store Hours. The Store, although part of the NFL Experience, is open to the public and you DO NOT NEED an NFL Experience Ticket to Enter!